Plentiful and beautiful - beetiful! Picnic season is here! 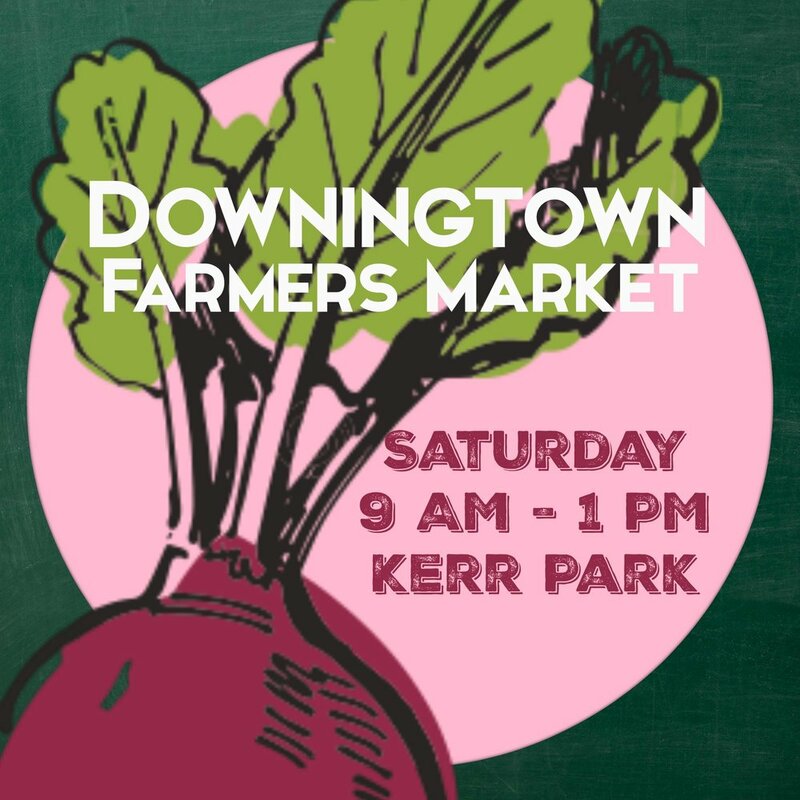 We're going to take the next few blog posts to talk about quick ideas for picnic sides using ingredients you can find at the farmers market. Today, it's deviled red beet eggs - what's a picnic with deviled eggs! Sure, we could have just shared a recipe for plain old white deviled eggs, but it's red beet season, and nothing is prettier than a red beet deviled egg. There are a few steps to this recipe, but stick with it because the the outcome is well worth it! Step One: pickle your beets! Here's an easy recipe for pickled beets, standard, quick and not complicated. You'll end up with great pickled beets. Step Two: Make hard boiled eggs, the most important step to get right!. Now this may sound silly, but you want old eggs. Older eggs are easier to peel. Our farmers bring such fresh eggs to market that if you try to hard boil them the day you get them home you'll end up with half the white stuck to the shell. You'll be cursing at the farmer and that's just not good. Your eggs should be about 2 weeks old to make peeling easier. Follow the directions here to make a perfect hard boiled egg. Step Three: Pickle your eggs by soaking them with your pickled beets. You'll likely need to turn them midway through the process to get them a uniform color. I like to keep them in them with the beets for about 12 hour. After that the yolks begin to soak up the beet color and, well, it just isn't pretty. Step 4: Devil them! Where to begin? There are so many recipes for deviled eggs. I love the recipe in Food With Friends by Leela Cyd. Yep, I still buy cookbooks, still love them! I kept my filling simple for this post, but there are so many different ways to flavor your filling it's difficult to decide. Here's my process with my tried and true process. I make a lot of deviled eggs. My 93 year old mother-in-law loves them and I want to stay on her goos side. The yolks are perfect. If you are getting a gray ring around your yolk, you're over-cooking your eggs! I love using my potato ricer to mash my yolks - gives a smooth texture! Really - you can do more than rice potatoes with your potato ricer! I used mayo, cumin, turmeric and lemon juice. I use a piping bag to fill the eggs - looks prettier! I like to use different tips to make the filling look nice. There you go, deviled red beet eggs - so delicious. What's next? 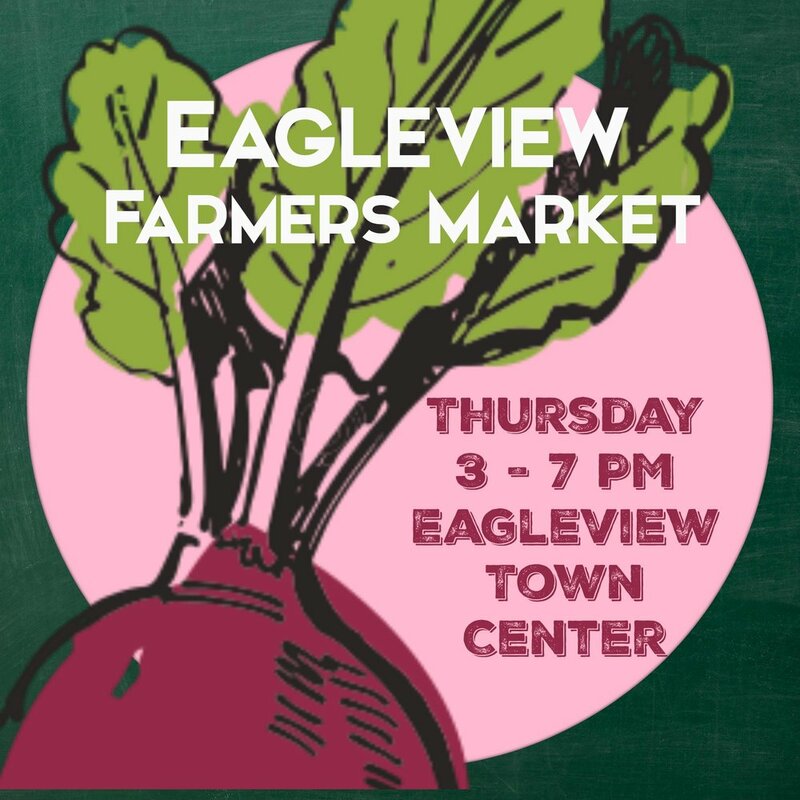 Tomorrow a great cabbage and cucumber slaw, plus zucchini ribbon salad. That's right - ribbons - the spiralizer is making it's debut. Wednesday we're cooking up an amazing carrot dip - delicious, simple and oh so good for you. And Thursday we're featuring a reader recipe using jams from Mamy'li Jam! Market folks love pickles. We love to talk about our pickle recipes. We think everyone should pickle. It's so easy, especially refrigerator dill pickles. Jenelle from Old Homestead Farm and I have been making this recipe for years. It is perfect. It is simple. It is delicious. Super crunchy! And once you get a few jars going, you can add more cukes (farmer lingo for cucumber!) to the mix to reuse the pickling juice. Or, you could add other produce - broccoli, cauliflower, zucchini, pretty much anything. Plus, I have a guilty obsession - applesauce from Whiskey Hollow. I'm swimming in quart jars to reuse from my applesauce obsession. If you've not tried it, well, the more for me! Hint - they are great pickle jars too! So here's a link to the recipe for Refrigerator Dill Pickles from Once Upon a Chef. Unlike other recipes that I fuss with, add a little more of this, little less of that, this is one that goes untouched. Its that good! So, be sure to pick up fresh Kirby cukes and dill from the market and you're all set for pickle glory! Remember, these are fresh refrigerator dill pickles, no hot water bath processing. Easy! Prepping your ingredients for the slaw is just a quick chopping of the cabbage and cukes. When slicing the cabbage just slice around the core. For the cukes, cut length-wise into quarters, and then slice away. And now for the shelling. I do love shelling peas, its nothing you can hurry, you simply sit and shell, and relax. I shelled a basket of peas probably about one and a half cups, worth every minute. I steamed the shelled peas for about 4 minutes in a steamer, and then ran under cold water to cool quickly. English Cukes from Kneehigh Farm, who can resist, the first of the season! 3, but they were small. And yes, I'm making slaw with all three of them and bringing it all together with a maple mustard lemon vinaigrette! Combine all of the ingredients in a dressing container and give it a good shake. I mean really shake it - you want the mustard to emulsify the dressing to keep it from separating. Shake a little more - perfect - you're there! In a big bowl toss the sliced cabbage, cukes, cooled peas, and mint - mix it up good - but don't smash those precious peas! Pour on the dressing to taste - you may need all of it - go ahead - use it up! Toss some more! Let it sit for about 30 minutes to really incorporate the flavors. Then have at it - crunchy and delicious - and, good for you too! I served this up with a chicken that I got from Canter Hill Farm, spatchcocked and semi de-boned whole chicken that was marinated in lemon juice and grilled to juicy perfection. Had full intentions to share that with you too but dinner got away from me. Guests arrived. Bourbon sours were served, and well, you know the rest of the story. Take my word, it was delicious. More on spatchcocking in another post. 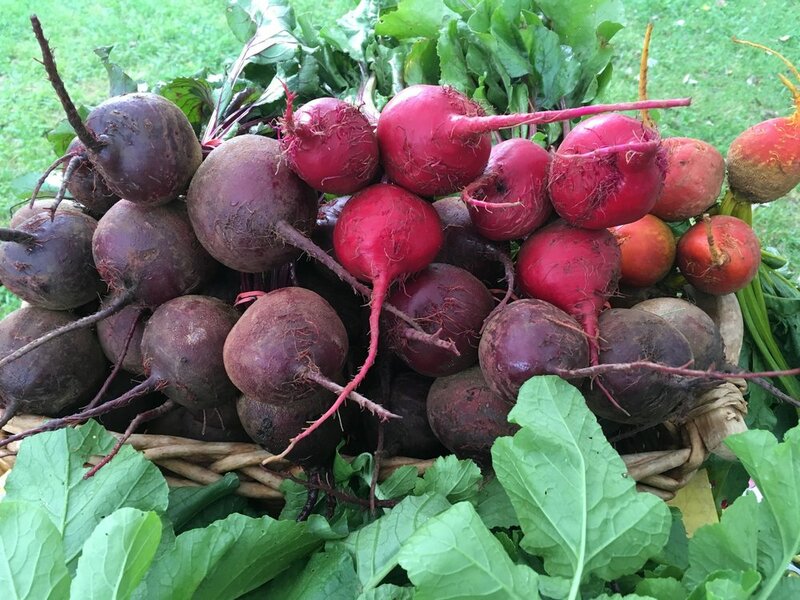 We love beets here at Growing Roots - it is the veggie of choice that stands as our logo, it's the name of the Growing Roots blog, The Market Beet, it's everwhere. Everything about them is just so appealing - their beautiful red color, or gold for golden beets, or red and white for chioggia beets. So tasty, and so good for you too! 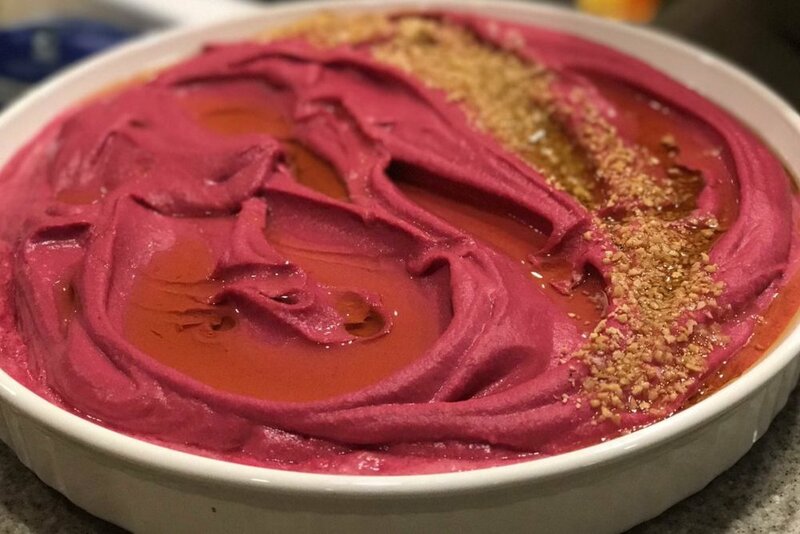 Well a good friend of Growing Roots, Nicole Riegl, from The Riegl Palate posted a great recipe last week for Roasted Beet Hummus. 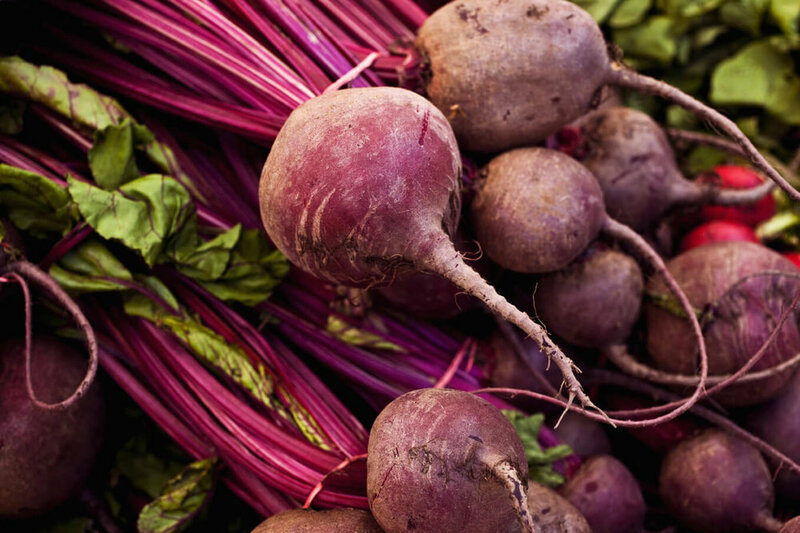 And, since we're just entering beet season, we though this was a perfect time to tip our hat to the beet, and show you something new to prepare using the humble beet! Just look at this beautiful hummus featuring beets! Imagine how delicious this would be with rye crackers, or on bread with a crumble of goat cheese! 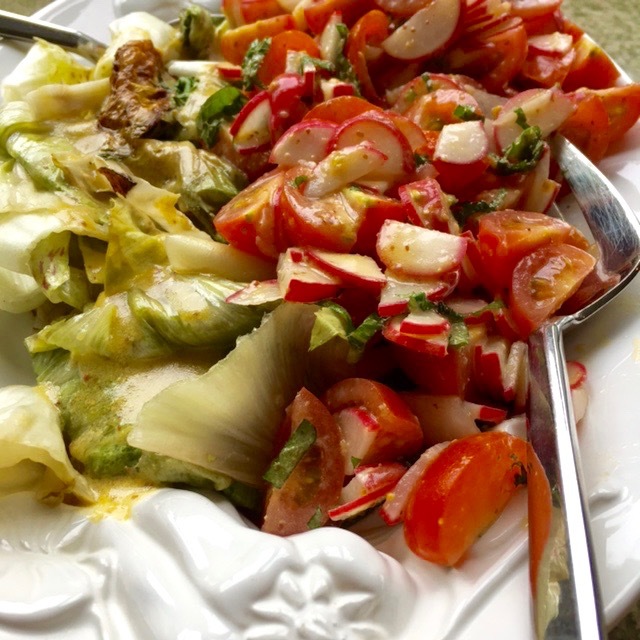 Please visit The Riegl Palate for this recipe and to explore more of Nicole's beautiful blog!